Tristram Stuart talks about global food waste resulting from agribusiness practices. Check out his powerful discussion on wasteful practices, and outrageous food surpluses in the world’s richest countries. It’s a fascinating mini-lecture, which encompasses a number of different ways in which food waste is a negative impact–from environmental considerations, to ethical concerns of world hunger. GMO: Your Right to Know? 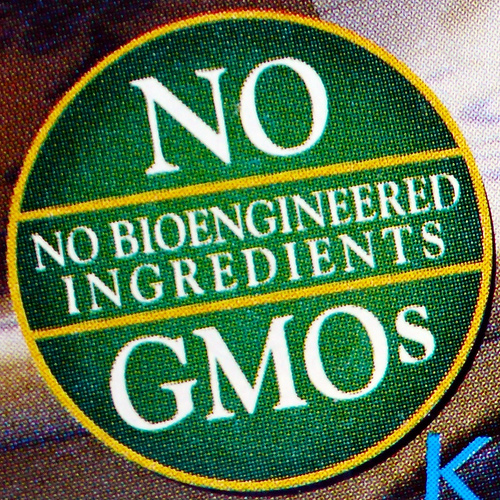 Alright, so I’m stepping outside of my comfort zone of local food for this post to talk about genetically modified organisms (GMOs). GMOs are a common, albeit controversial, part of agribusiness food, and purchasing local food is the best way to avoid GMOs making their way into your meals. As such, I think this is an important part of my discussion about local food. With the recent California decision not to pass Prop 37, which would have forced food companies to label products that contain genetically modified organisms, much controversy has surrounded what exactly GMOs are, what the impact is—whether this issue really matters. As a baseline, an article from Organic Authority states that GMOs are created when a gene from one species is transferred to another, creating something that would not be found in nature. Scientific evidence regarding the potential dangers of GMOs are currently inconclusive; regardless, a strong argument in favor of Prop 37 is that despite the science behind GMOs, folks should have the right to know if their food has been genetically engineered. According to a 2012 article from CNN regarding the labeling of GMOs, the FDA suggests that consumers wouldn’t be able to tell the difference between, say, salmon that had had its DNA modified versus salmon that hadn’t been genetically tempered with. This point lends credence to the notion that labeling food that has been genetically modified would create a stir and instill an unnecessary fear in consumers. To many, “GMO” is simply a devil term. 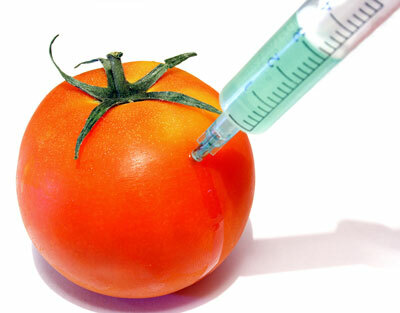 Why does a tomato need genetic modification? According to the non-GMO Project, perhaps the biggest problem associated with GMOs is the unknown risk we could be incurring through consuming foods with altered DNA. 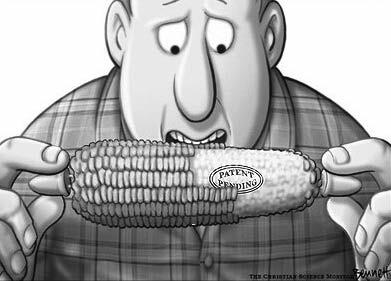 In the U.S., the government has approved GMOs based on studies conducted by the same corporations that created them and profit from their sale. Essentially, while scientific evidence is inconclusive, corporations such as Monsanto are given the power to make potentially life-changing decisions regarding the engineering of our most basic form of sustenance—the food we use to nourish our bodies. 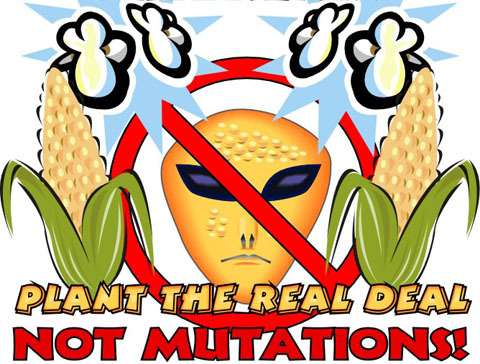 The human species has survived on “the real deal” for thousands of years before the introduction of bio-engineered foods in 1994–what’s the need for mutated corn now? Founder of Food Democracy Now, Dave Murphy, assuredly stated in a November 2012 CNN article on Prop 37 that the failure is a small setback, but the fight is far from over. “It will…change how food companies have to respond to the millions and millions of Americans across the country who want to know what they’re eating…we are just getting started.” In the meantime, perhaps the greatest challenge for consumers in the “right to know” debate will be to evaluate whether they want to seize control of their diets, or let corporations do the quality control for them. Look for this seal when choosing food at the grocery store. You DO have a choice! A few weeks ago, I sat down with Bowl of Good’s general manager, Ben Bergey. Bowl of Good has gained a reputation for locally-sourced, honest-to-goodness food, and I wanted to get the inside scoop to see what the hype was all about. I knew that the restaurant has an awesome selection of good-for-you meals, but I was interested in their food politics, and why they choose to stay local. Ben started off the meeting by telling me a little bit about Bowl of Good’s history. 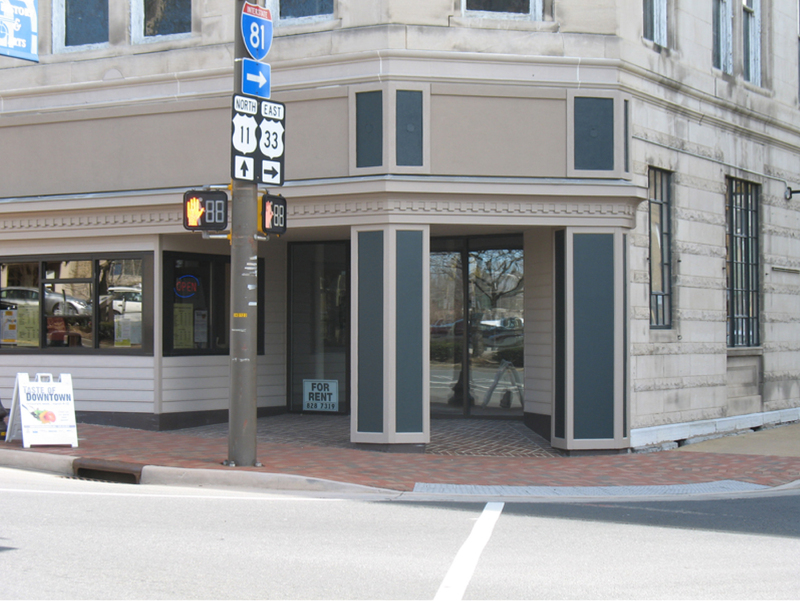 It all started about seven years ago, as a small café inside of Kate’s Natural Products (also located in Harrisonburg). Since that time, Bowl of Good has expanded, now having two locations in Harrisonburg—one off of Mt. Clinton Pike, and the other just off of Port Republic Rd, where I met Ben. 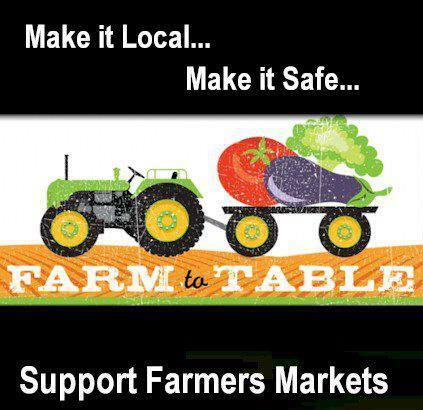 Bowl of Good has always had a passion for local food, and valuing keeping business dollars in the local community. This passion is what drives the restaurant to keep as much of its food as possible locally-sourced. 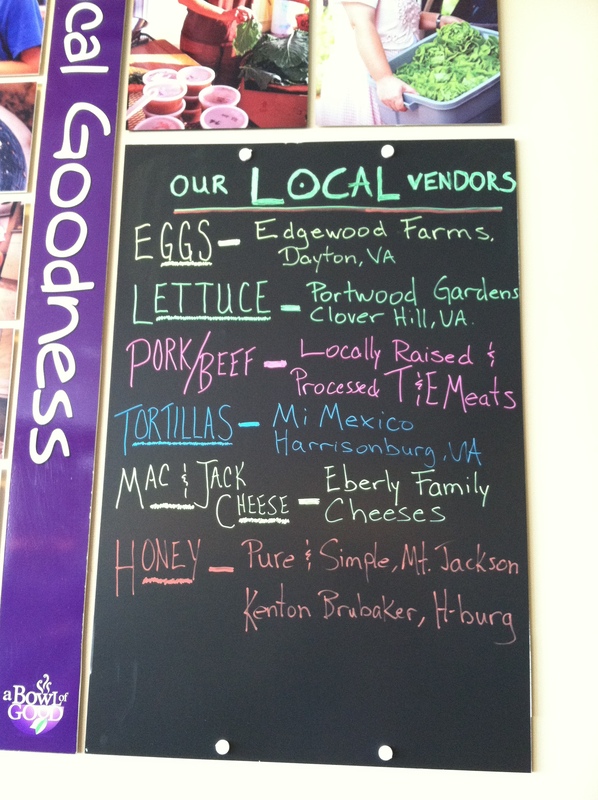 check out all these local vendors! Bowl of Good draws its inspiration from a number of global culinary inspirations, while keeping local food sources in mind (from Global to Local—sound familiar?). The owner of the restaurant spent many years abroad, inspiring the diversity of dishes found on Bowl of Good’s menu. As a result, you can enjoy a Maharaja Bowl, my personal favorite, which has curried lentils over rice topped with organic yogurt, mango chutney, and a side of pita bread. Or, try the Out-of-Africa Bowl, featuring Nigerian chicken, bean and cabbage stew, and rice, topped with sour cream, green onions, and a side of 9-grain bread. 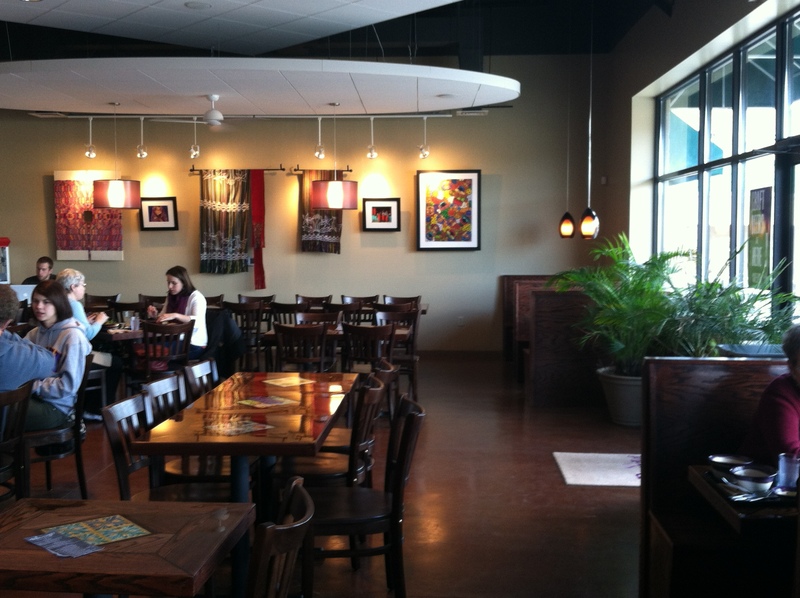 There are also a number of Thai, Mexican, Italian, Greek, and American dishes to choose from. 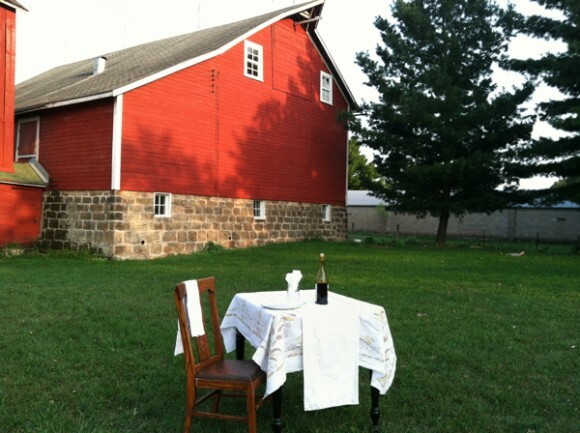 You can also try one of their awesome sandwiches, or a bowl of gourmet soup. Bowl of Good is also open early for breakfast, where you can enjoy one of their awesome dishes, like the Wake Up Wheatberry Bowl, for about four or five dollars. Bowl of Good also features local music, and is actively involved in James Madison University initiatives for a better world. For example, Bowl of Good will be donating 10% of all proceeds to benefit the Shenandoah Valley Justice Initiative at JMU to end human trafficking. Speaker Anna Curfman will give a talk & JMU’s all-female a capella group, Note-oriety, will perform, and much more. Not only is this restaurant committed to sustainable food practices, but is also actively committed to making the world a better, more ethically-sound place to live. When I asked Ben if they had a lot of business from JMU students, I was surprised to hear that the answer was, “eh.” While they get a decent flow of traffic from hungry Dukes, it’s not as much as they would expect, particularly considering its proximity to campus. We discussed why this may be, and Ben suggested that price may be an issue for some folks. Bowl of Good is labor-intensive, meaning the meals are made from scratch, on-premises, rather than pre-packaged. This inevitably drives the food prices up. However, when I took a look at the menu prices, the most expensive item I could find was $8.07—with the average meal costing around six bucks. Who said local food had to be more expensive? the global feel at A Bowl of Good isn’t limited to the menu–they’ve also nailed the cultural diversity in the restaurant’s ambiance! However, I also considered that local bar AJ Gators, located right next door to Bowl of Good, is the business that attracts the most Dukes, especially on the weekends. If a student has the choice between buying a few rounds, or grabbing a homemade, locally-sourced, meal, he or she will more often choose the former option—leaving Bowl of Good to go largely unnoticed. When considering that most people don’t really care where their food comes from, local food won’t make a difference if you can grab wings and a brew for the same price. To my fellow JMU students: we can do better—we DESERVE better. Bowl of Good provides us with a better, healthier alternative to the options afforded to us in corporate restaurants. With global inspiration and a local focus, Bowl of Good is committed to a better meal, and a better community, for all of us. Give it a try—you won’t regret it! As always, happy eating, folks! One of the most exquisite pleasures in life is curling up with a journal or a good read, and a strong cup of coffee. Thankfully, Harrisonburg boasts a number of local coffee shops in town where students and townies alike can pass time with a cup of java. 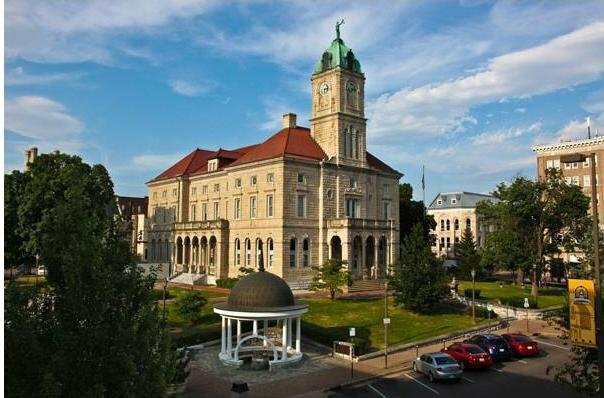 Perhaps Harrisonburg’s best kept secret from coffee lovers everywhere is Court Square Coffee, modestly located on the first floor of the Newman-Ruddle building, just across from the historic Harrisonburg courthouse. Unlike your rushed, impersonal morning stop at Starbucks, Court Square Coffee is an answered prayer for a local food (and drink) junkie who prefers her java with a side of personal connections and down-to-earth conversations. During my first visit to Court Square Coffee, where I ordered one of the coffee shop’s specialty drinks, the Raspberry Truffle Mocha (to DIE for), I found myself easily engaging in conversation with the owner, Jeremiah, and a few other customers. Jeremiah knew every one of his customers by name, and cheerfully chatted with us about what was going on in our lives. When I asked him to give me a little background on his business, he was eager to tell me all about Court Square Coffee’s commitment to sustainability, and coffee brewed with integrity. Court Square Coffee from the outside. 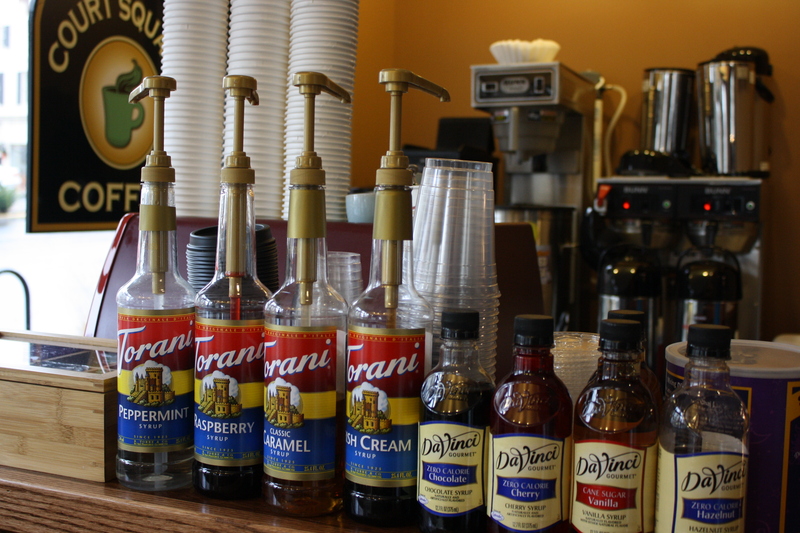 The three key ingredients in this shop’s coffee are organic, local, and fair trade. Jeremiah gets his coffee beans from Trager Brothers Coffee, a 100% Organic micro-roastery located just 64 miles away from Harrisonburg. Jeremiah is clearly mindful of his business’ carbon footprint, keeping his products within 100 miles of the store, but the sustainable practices don’t stop there. Court Square Coffee also features pastries from local shops like O Cakes, located in Harrisonburg. Commitment to integrity in every cup! 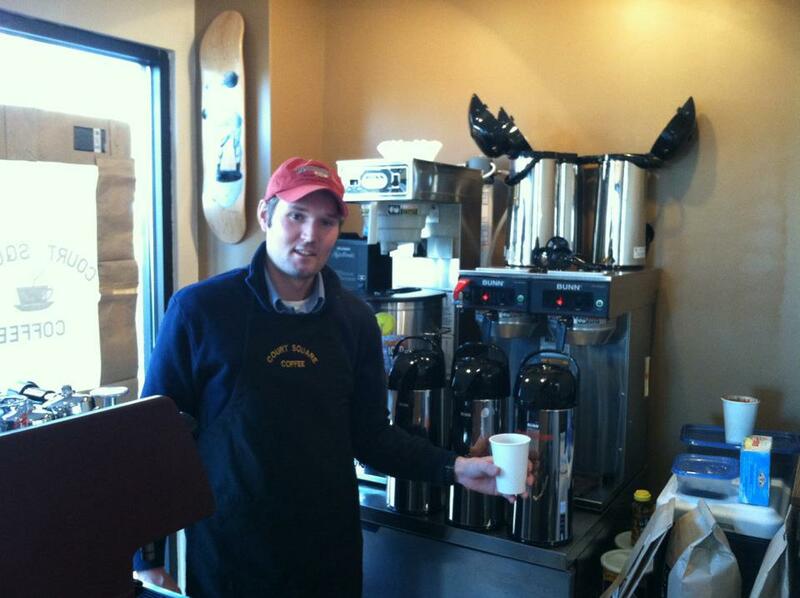 In addition to organic, local goodies, Jeremiah’s coffee is also fair-trade ensured. And no, he doesn’t just slap the label on his coffee cups as a fashion statement—his shop features an informational table with flyers that explain what fair trade is, and why it’s so important. 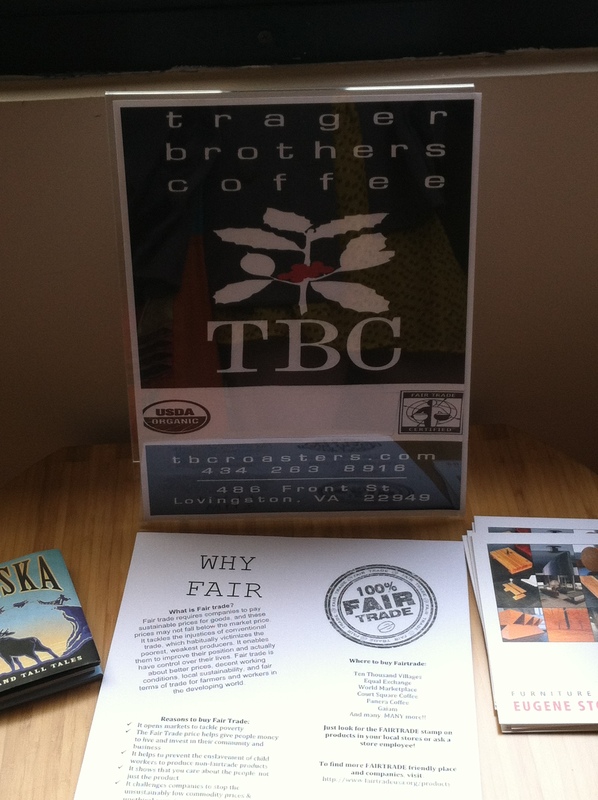 Since fair trade isn’t a concept that’s been talked about on the blog before, I’ll recap the highlights, per Jeremiah’s flyer. Getting informed while you wait for a fresh brew! Fair trade requires companies to pay sustainable prices for goods, and these prices may not fall below the market price. It tackles the injustices of conventional trade, which habitually victimizes the poorest, weakest producers. It enables them to improve their position and actually have control over their lives. Fair trade is about better prices, working conditions, local sustainability, and fair terms of trade for farmers and workers in the developing world. There are a number of reasons why fair trade is an important part of the food politics equation, and honest eating practices. It opens markets to tackle poverty, challenges companies to stop unsustainably low commodity prices and unethical sourcing, and makes justice an invaluable part of the trade equation. As an added bonus, FAIRTRADE farmers normally produce organic, natural products, giving us the highest-quality goods while protecting the environment. Court Square Coffee is one of the most responsible businesses I’ve had the pleasure of supporting. Jeremiah is committed to living his politics with locally-sourced, ethically sound products, with no short supply of a kind, welcoming demeanor. He runs a small, simple, down-to-earth shop that is inviting to all who enter, and I can assuredly promise that a one-time customer at Court Square Coffee simply doesn’t exist. Once you try this shop’s honest-to-goodness brew, you won’t feel the same about commercialized coffee ever again—that’s a guarantee. 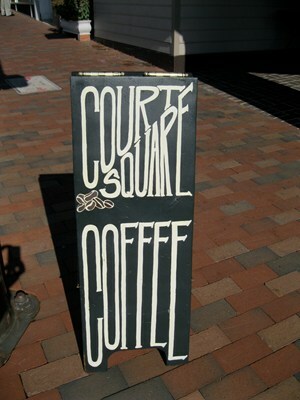 Also, you can keep up-to-date with Court Square Coffee on Facebook by clicking on this link here. As always, happy eating (and drinking)! As my local food blog has progressed over the span of the past few months, I’ve come to realize that the issue takes on countless forms, and intersects with a number of bigger issues, from economic ramifications, to environmental tolls. The implications of choosing local food over industrial food are abundant, though perhaps the most personally meaningful externality is the value that local, organic, sustainable, healthy food has on the individual. 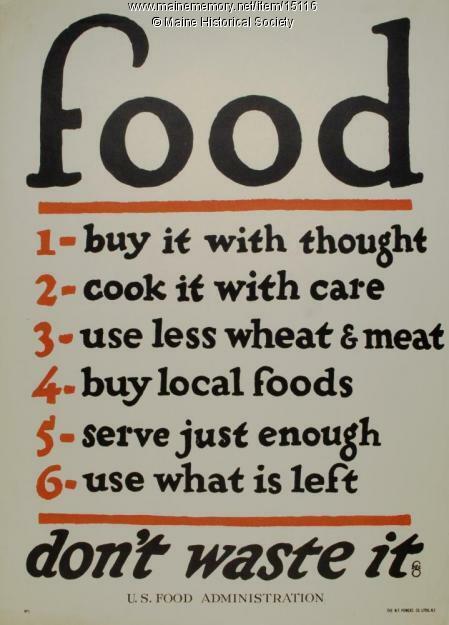 I harp on this notion often, but it’s worth repeating time and time again: food is our most basic form of sustenance. We are living beings, requiring nourishment to survive, period. Despite this, I’m amazed at how folks don’t seem to care, or think twice, about what they put in their bodies. “buy it with thought.” common sense, folks! I could advocate for this issue on the grounds of environmental sustainability, but that would isolate a large audience. I could discuss how local food stimulates the local economy, rather than outsourcing revenue to other parts of the country—only to be accused of being anti-capitalism. The list goes on and on. The point is, the Communications major in me knows that the most fundamental aspect in advocating for any issue is establishing legitimacy and interest with my intended audience. Advocating for local food has such potential, because there really is a slice of the pie for everyone. Everyone eats. Few people care about what goes on behind the scenes, though. This disconnect has, by far, been the most frustrating part of spreading awareness. So, what’s next? While food politics and ethics are an essential part of understanding the core of what sets local food apart, it’s not going to be of interest to the average Joe, who wants an abbreviated, hit-‘em-between-the-eyeballs reason for why Friendly City Co-Op is worth his time, over Wal-Mart. As such, expect fewer “logistical” posts in the weeks to come. While I’ll still post newsworthy bits occasionally, I’ll be interspersing these segments with more hands-on, direct approach-style posts. I’ll be going to businesses in the ‘Burg who are living their food politics, as a means of showcasing why these folks see the value in local food and sustainable eating. No more textbook definitions of “organic” or “food miles”—rather, I want my readers to understand the accessibility, and the human element, involved in this advocacy issue. So, if you think I’m just a hippie who’s drunk off the Greenie Kool-Aid, try again! I encourage you to set your personal politics aside, and think for a moment about how you deserve better. You deserve to eat food that’s free of pesticides and herbicides. You deserve fresh produce that’s not radiated or injected with artificial dye to give the appearance of freshness. You deserve food that’s fresh, rather than frozen and reheated. And you can have it without incurring a huge cost, if you know where to look. If you’re interested in eating a burger without a side of colon cancer, then stay tuned. The issue of where your food comes from, and the steps taken to get it there, affects you too. My name is Eva McNamara, and I’m a senior here at Smith. I’m also a proud member of the new Sustainable Food Concentration, and this semester I am SO excited to be writing about all things food for CEEDS.